Customer Success is about proactively managing a customer relationship towards demonstrable value… and creating a great experience in the process. As anyone who has ever had the responsibility for doing this can attest, it takes more than just a CSM team to be successful. You’ve heard people talk about “a culture of customer success” or “a customer-centric company”, and while much of what it takes to win and be successful is empathy for and an understanding of the perspective of the customer, those can be pretty empty words without a way for the whole organization to put the philosophy into action. In order for a company to help its customers achieve success, every part of the organization needs to engage… and deliver, but how do you do it in a way that scales? As in many subjects related to Customer Success there is no one answer that fits every situation. The subscription economy is continually expanding and evolving, and what it takes to make an enterprise B2B customer successful can be very different than what it takes to make a large number of B2C customers successful. The model in this article can be applied to a number of different products and industries and is offered as a framework to ensure that different functions in your company are thinking about the success of your customers from every aspect of their experience. As a software solution provider, you are no longer expected to just deliver a product. Your customers expect you to help make them better at what they do as a result of doing business with you, but it isn’t reasonable to think that hiring a bunch of CSMs is going to be either a scalable or an effective way of making that happen. In fact, if you’re expecting the success of a company and the satisfaction of your customers to be completely on the shoulders of your CSM team, then you’re setting yourself (and your CSM team) up for failure. So how do you implement a culture of customer success across your organization? But actually delivering the value and making the customer successful takes much more than a CSM. In fact, in many companies, the customer success organization doesn’t have a deep relationship with every customer, and in all companies, it isn’t the most scalable way to impact the customer experience (you do have a product, after all). A pyramid provides a very effective model for how different aspects of what you do can influence the success of your customers, On the bottom of the pyramid, as a true foundation, are the components that scale the best, primarily because they are upstream in the user experience and reach the broadest audience. As you move up the pyramid are components that don’t scale as well; however they provide immense value to the subset of customers who need (and use) them. I wouldn’t argue that any of these is more important than another, and each type of product (consumer, SMB, enterprise) will have a different Customer Success pyramid, or will have different dependencies on different layers of the pyramid. In some companies and for some products, the specific levels of the pyramid may differ, and in consumer products, some levels may not even exist. The diagram I show here is designed for delivering Customer Success to B2B customers. A consumer-only product will likely not have a Professional Services component to it; however as even some “consumer” products are moving into the B2B space, they’ll need to add less scalable, and more specialized offerings in order to make their higher value customers successful. Customer Success starts with your product: It fundamentally has to work well; it must do what it is supposed to do; and it must do it in a way that ensures adoption of the features that truly differentiate you and will make your customers sticky. As your organization learns from customers, you need to ensure that you’re getting that feedback into your product. 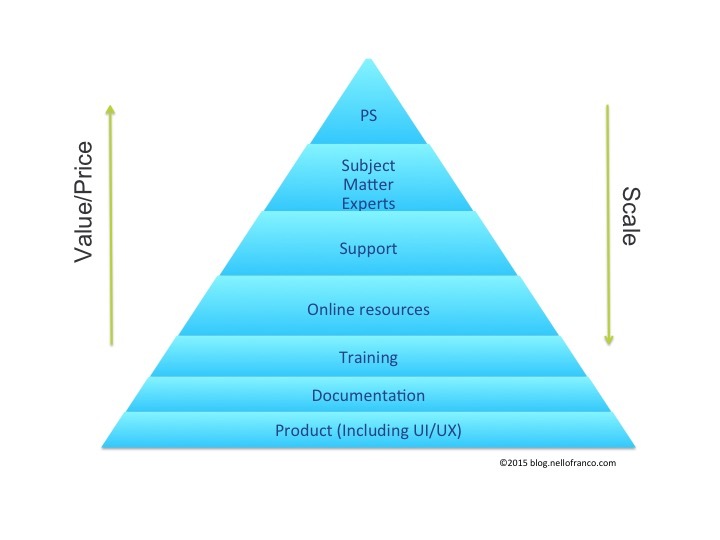 Every layer above this in the pyramid will only deliver incremental value to what your product offers, and if there are fundamental deficiencies or usability issues with your product, then you are eroding the potential incremental value that those layers can deliver. I can’t stress the importance of this enough as I’ve seen and lived it in the real world. If your product has fundamental shortcomings, the time and effort of everyone else in your organization is spent on “propping up” your core technology. You won’t have the time and credibility to deliver incremental value. To some extent, no product is perfect, and the layers above will always help plug some gaps, but to the extent your product is intuitive and accessible, you can use the other layers to really provide a differentiated, service-oriented experience. It’s also important that you use every layer above Product in the pyramid to gather actionable information that will help you improve your product and the experience it delivers to your customers. Similar to the product, your documentation has the potential to touch every user… well, every user who can access it quickly and easily. Given the broad potential reach of documentation, it’s vital that your documentation is accessible, contextual, and modularized, with specific relevance to the part of the application or function that the user needs to learn more about. If your documentation isn’t easily accessible by your users *at the time and in the context in which they need it*, then many of them aren’t going to read it. Training material can take a number of forms, from multi-day customized on-site courses to short, focused, easy to digest, “how to” examples. Best in class companies have a range or training materials available and have implemented comprehensive LMS systems to gather feedback to understand which courses are providing the most value to customers. Course content should continuously be updated based on feedback gathered at higher layers of the pyramid. For example, if a significant number of cases are being opened related to system configuration, then your training team should be delivering additional modules around configuring the system. By creating those courses, you’ll not only be lowering the number of support cases that your support team has to deal with, you’ll also be creating a better customer experience by not having your customers face the issues at all. Your customers are telling you (via support) that parts of your application aren’t intuitive. The short term answer is to develop better training, the longer term answer is to make the product more intuitive. As your training curriculum evolves, it should be about more than just your product features, it should also include best practices for using your product and should complement your content marketing. For example, if you provide a CRM solution, your training shouldn’t just cover how to create an opportunity on your platform, it should provide guidance on what information is relevant in an opportunity as well as how best in class companies manage opportunities and how they use that information to better understand their forecasts and predict their business. If developed properly, training material will also highlight strengths and differentiators of your product without coming off as additional sales collateral. This layer can really help your organization scale and should be monitored and updated constantly: both proactively based on what you want your customers to know; as well as reactively, based on what your customers are asking you and what they are consuming. Online resources can be updated many times per day by many people. These updates can be as involved as developing best practices derived from a large number of customer engagements, then formally publishing them; or as effortless as having a customer or partner respond to an open forum question. The analytics around online resources can provide incredibly valuable insights around what your customers are reading, talking, and thinking about. Some online resources don’t even need to be owned or managed by your company. Participate in forums that your company doesn’t manage, but are relevant to your space. If you have a partner ecosystem, both you and your partners should be providing online content for each others’ sites. Many companies that provide solutions directly to consumers enable the vast majority of their customer success through these four layers alone, with the majority of content/investment/usage happening in layers 1 and 4 (product and online resources). By far, you get the most reach and scale from these first four layers as they’re all based on delivering functionality and content to your audience in a “one to many” model. Working with your Marketing, Customer Support, and Professional Services teams you can target and develop content that will be relevant for and specific to a number of different customer segments. While the first four layers of the pyramid may be sufficient for some consumer products, enterprise products require enterprise support. World class enterprise support requires both rich and relevant online content (layer 4), as well as a strong team that can help customers dig in to complex issues. Your team members in support need to have deep product and technical skills in order to provide your customers with resolution to their issues as well as “soft” skills to manage your customers through challenging situations. For a great resource on how to deliver a great customer experience via your Support team, I’d highly recommend Flavio Martin’s blog. Generally CSMs fit one (or in some cases both) of two profiles: 1) a subject matter expert; and 2) a relationship manager. Assuming the relationship manager role transcends all levels of the pyramid, subject matter expertise delivered by people who know your product, the industry, and your customers can help ensure your customers are getting off on the right foot and that they’re not getting “stuck” along the way in their implementations. A common question I get is “how is this role different than what a company should offer in professional services?” The main difference is that this subject matter expertise is delivered in very small doses, sometimes reactively, and in many cases at no additional cost to the customer. An efficient Professional Services organization would have a hard time delivering this expertise without a negative impact on profit margins. Subject Matter Experts can also help position the value of a deeper, longer term Professional Services engagement as a result of their interaction with the customer. Services which you can deliver while making sustainable profit margins and where you aren’t competing against low cost, “commodity” resources for a lower price. While a professional services team needs to operate in a manner that contributes positively to the company’s margins, it’s fundamental purpose, if it’s part of a subscription software company, should be to drive the success, retention, and growth of your subscription customers. We measure our PS team’s performance not only on basic PS metrics, but also on delivery success, time to value, customer advocacy, and, yes, our renewal rates, because our PS team has significant impact on the success of our customers.